This 1957 Mercedes-Benz 300 SL Gullwing, chassis no. 7500071, is the fifth from last example ever produced, and as such carries the most desirable late-production features, as well as the optional Becker Mexico radio and full leather upholstery. The car was originally delivered to 28-year old Donald H. Bueermann of Portland, Oregon, landing with young Arthur L.W. True, heir to a Spokane oil fortune and a well-known figure in Pacific Northwest sports car circles in the early 1960s. Sadly, True passed away in 1967 and his family subsequently donated several of his automobiles to the Henry Ford Museum. The museum decided the Gullwing was outside their needs, and it was soon sold to the current proprietor, a resident of Jackson, Michigan. While the owner enjoyed his 300 SL, he never had a place to maintain it to the level it demanded, and so for the last four decades it has been on display in the Special Interest Gallery of the ACD Automobile Museum in Auburn, Indiana, where it has been viewed by hundreds of thousands of visitors to the legendary facility. 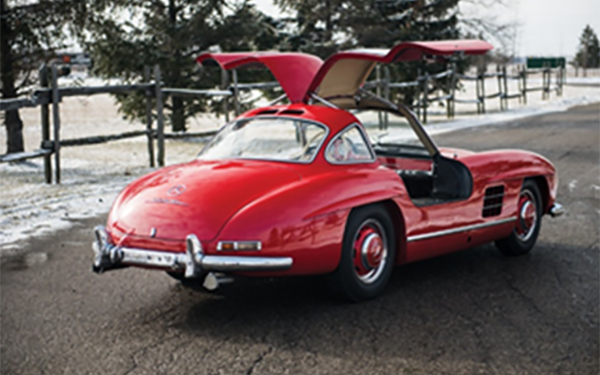 For many Midwestern enthusiasts, it was their very first “in-person” view of a Gullwing. Thanks to its museum residence, the 300 SL Gullwing has survived in exceptionally original condition, retaining much of its original Fire Engine Red factory paint. 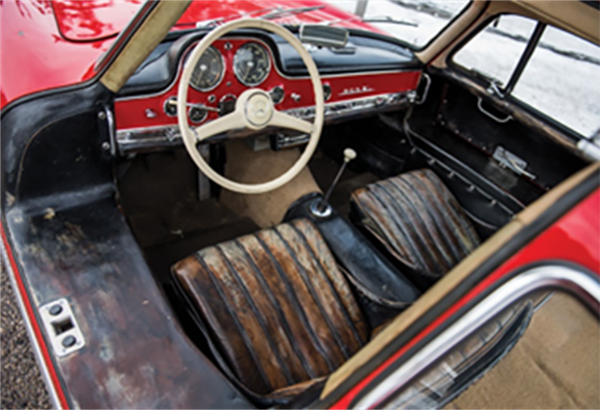 The interior was upholstered in the correct, now unobtainable surface-dyed black leather decades ago, and is tear-free, showing only wear from the driver climbing in and out. The original Michelin spare tire is found in the trunk, and two of three original belly pans accompany the car. Amazingly, all 36,375 miles currently recorded were added prior to 1968. 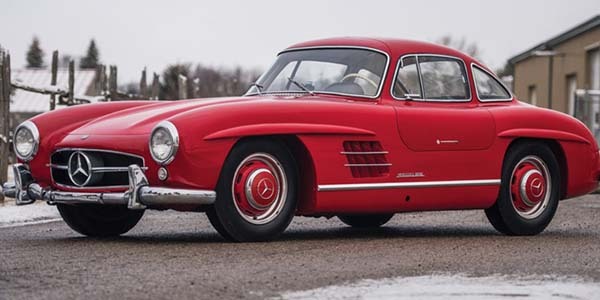 The car is no up for auction via RM Sotheby’s, and the current owner has generously chosen to donate 100 percent of hammer proceeds from the Gullwing to his favorite cause, the Jackson, Michigan YMCA, as a major gift towards the construction of a state-of-the-art new building (Est. $1,000,000 – $1,300,000). The Gullwing joins a 1962 Mercedes-Benz 300 SL Roadster, a 1969 Ferrari 365 GTB/4 Daytona Spider Conversion, a 2008 Ferrari F430 Challenge “Art Car” painted for Miami Art Basel, and a 10.8-mile 2006 Ford GT.